Soak garbanzo beans for about 6 hours. Cook it adding a pinch of salt. Keep it aside. In the mean time, cut mango and coconut evenly into very tiny pieces. Take a pan, pre heat oil, add mustard seeds, when it splutters add urad dhall, red chillies and asafoetida powder and fry it till it becomes golden brown. 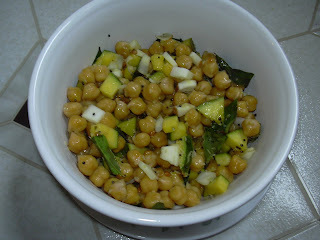 Now add the cooked garbanzo beans, add mango and coconut pieces, adjust salt and mix it well. Turn off the stove. Serve it hot and can have it as evening snack. As we all know, garbanzo beans is rich in protein and mango is rich in vitamin C which is very essential for the kids during winter days. wow... enakku eppo marina beach sundal gnabagam varuthu vidhya... really good.. This type of beans are typical here in Portugal. We use them in stews, salads and with codfish. Using thengai, mangai in sundal gives a great taste...I have tasted only once,in marina,but was great! 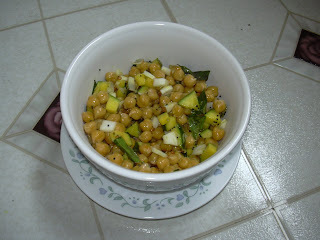 Sundal looks delicious....I have tasted only once,in marina,but was great!